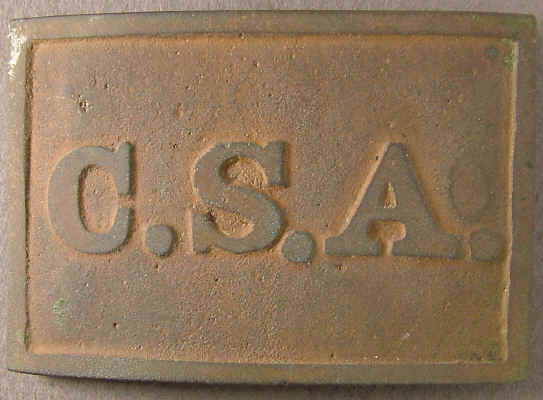 Buckle depicts "CSA" and is a rectangle belt plate broadly used in the Confederacy. This style is noted for the rounded style of lettering. Most Virginia style plates are relatively thin but the thickness can vary considerably. Plate is cast, hooks were originally cast straight up, then bent into place once the casting was removed from the mold, and often this will leave an impression on the face. Plate may have been made in Virginia during the war and production may have been shared with more than one manufacturers, there can be variations one casting to the next. However more seem to show up in the western theater than the eastern theater so the question of where manufactured is unresolved. P0321...Confederate rectangle belt plate, CSA, Virginia style, Confederate wartime manufacture. 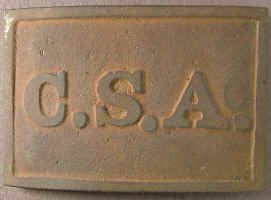 Buckle depicts "CSA" and is a rectangle belt plate broadly used in the Confederacy. This style is noted for the rounded style of lettering. Most Virginia style plates are relatively thin but the thickness can vary considerably. Plate is cast, hooks were originally cast straight up, then bent into place once the casting was removed from the mold, and often this will leave an impression on the face. Plate may have been made in Virginia during the war and production may have been shared with more than one manufacturers, there can be variations one casting to the next. However more seem to show up in the western theater than the eastern theater so the question of where manufactured is unresolved. Plate measures 49.3mm X 71.5mm. Dug buckle, hooks intact. Recovered: Shelbyville Tennessee by Larry Hicklen, original discovery was published NST Vol XI, No 3 Mar - Apr 1984 pg. 7 center right. Ref: Mullinax Expanded Edition, Plates 084 to 099, this is the plate published. P1846...Confederate rectangle belt plate, CSA, Virginia style, Confederate wartime manufacture. Buckle depicts "CSA" and is a rectangle belt plate broadly used in the Confederacy. This style is noted for the rounded style of lettering. Most Virginia style plates are relatively thin but the thickness can vary considerably. Plate is cast, hooks were originally cast straight up, then bent into place once the casting was removed from the mold, and often this will leave an impression on the face. Plate may have been made in Virginia during the war and production may have been shared with more than one manufacturers, there can be variations one casting to the next. However more seem to show up in the western theater than the eastern theater so the question of where manufactured is unresolved. 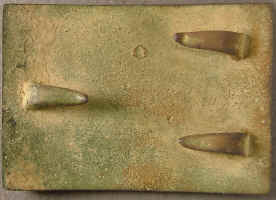 Plate measures 48.8mm x 71.5mm. Dug plate, hooks intact. Recovered: Shell Mound Tennessee in 1999.